For missile that follows a ballistic trajectory, see Ballistic missile. A cruise missile is a guided missile used against terrestrial targets that remains in the atmosphere and flies the major portion of its flight path at approximately constant speed. Cruise missiles are designed to deliver a large warhead over long distances with high precision. Modern cruise missiles are capable of travelling at supersonic or high subsonic speeds, are self-navigating, and are able to fly on a non-ballistic, extremely low-altitude trajectory. The idea of an "aerial torpedo" was shown in the British 1909 film The Airship Destroyer, where flying torpedoes controlled wirelessly are used to bring down airships bombing London. In 1916, Lawrence Sperry built and patented an "aerial torpedo", the Hewitt-Sperry Automatic Airplane, a small biplane carrying a TNT charge, a Sperry autopilot and a barometric altitude control. Inspired by these experiments, the United States Army developed a similar flying bomb called the Kettering Bug. Germany had also flown trials with remote-controlled aerial gliders (Torpedogleiter) built by Siemens-Schuckert beginning in 1916. In the period between the World Wars the United Kingdom developed the Larynx (Long Range Gun with Lynx Engine), which underwent a few flight tests in the 1920s. In the Soviet Union, Sergei Korolev headed the GIRD-06 cruise missile project from 1932 to 1939, which used a rocket-powered boost-glide bomb design. The 06/III (RP-216) and 06/IV (RP-212) contained gyroscopic guidance systems. The vehicle was designed to boost to 28 km altitude and glide a distance of 280 km, but test flights in 1934 and 1936 only reached an altitude of 500 meters. In 1944, Germany deployed the first operational cruise missiles in World War II. The V-1, often called a flying bomb, contained a gyroscope guidance system and was propelled by a simple pulsejet engine, the sound of which gave it the nickname of "buzz bomb" or "doodlebug". Accuracy was sufficient only for use against very large targets (the general area of a city), while the range of 250 km was significantly lower than that of a bomber carrying the same payload. The main advantages were speed (while not sufficient to outperform contemporary interceptors) and expendability. The production cost of a V-1 was only a small fraction of that of a V-2 supersonic ballistic missile, carrying a similar-sized warhead. Unlike the V-2, however, the initial deployments of the V-1 required stationary launch ramps which were susceptible to bombardment. Nazi Germany, in 1943, also developed the Mistel composite aircraft program, which can be seen as a rudimentary air-launched cruise missile, where a piloted fighter-type aircraft was mounted atop an unpiloted bomber-sized aircraft that was packed with explosives to be released while approaching the target. Bomber-launched variants of the V-1 saw limited operational service near the end of the war, with the pioneering V-1's design reverse-engineered by the Americans as the Republic-Ford JB-2 cruise missile. Immediately after the war the United States Air Force had 21 different guided missile projects, including would-be cruise missiles. All but four were cancelled by 1948, — the Air Materiel Command BANSHEE, the SM-62 Snark, the SM-64 Navaho, and the MGM-1 Matador. The BANSHEE design was similar to Operation Aphrodite; like Aphrodite, it failed, and was cancelled in April 1949. Concurrently, the US Navy's Operation: BUMBLEBEE, was conducted at Topsail Island, North Carolina, from c. June 1, 1946, to July 28, 1948. [better source needed] Operation: BUMBLEBEE produced proof-of-concept technologies that influenced the US military's other missile projects. During the Cold War period both the United States and the Soviet Union experimented further with the concept, deploying early cruise missiles from land, submarines and aircraft. The main outcome of the United States Navy submarine missile project was the SSM-N-8 Regulus missile, based upon the V-1. The United States Air Force's first operational surface-to-surface missile was the winged, mobile, nuclear-capable MGM-1 Matador, also similar in concept to the V-1. Deployment overseas began in 1954, first to West Germany and later to the Republic of China (Taiwan) and South Korea. On 7 November 1956, U.S. Air Force deployed Matador units in West Germany, whose missiles were capable of striking targets in the Warsaw Pact, from their fixed day-to-day sites to unannounced dispersed launch locations. This alert was in response to the crisis posed by the Soviet attack on Hungary which suppressed the Hungarian Revolution of 1956. Between 1957 and 1961 the United States followed an ambitious and well-funded program to develop a nuclear-powered cruise missile, Supersonic Low Altitude Missile (SLAM). It was designed to fly below the enemy's radar at speeds above Mach 3 and carry a number of hydrogen bombs that it would drop along its path over enemy territory. Although the concept was proven sound and the 500 megawatt engine finished a successful test run in 1961, no airworthy device was ever completed. The project was finally abandoned in favor of ICBM development. While ballistic missiles were the preferred weapons for land targets, heavy nuclear and conventional weapon tipped cruise missiles were seen by the USSR as a primary weapon to destroy United States naval carrier battle groups. Large submarines (for example, Echo and Oscar classes) were developed to carry these weapons and shadow United States battle groups at sea, and large bombers (for example, Backfire, Bear, and Blackjack models) were equipped with the weapons in their air-launched cruise missile (ALCM) configuration. Cruise missiles generally consist of a guidance system, payload, and aircraft propulsion system, housed in an airframe with small wings and empennage for flight control. Payloads usually consist of a conventional warhead or a nuclear warhead. Cruise missiles tend to be propelled by a jet engine, turbofan engines being preferred due to their greater efficiency at low altitude and subsonic speed. Guidance systems also vary greatly. Low-cost systems use a radar altimeter, barometric altimeter and clock to navigate a digital strip map. More advanced systems use inertial guidance, satellite guidance and terrain contour matching (TERCOM). Use of an automatic target recognition (ATR) algorithm/device in the guidance system increases accuracy of the missile. The Standoff Land Attack Missile features an ATR unit from General Electric. Cruise missiles can be categorized by size, speed (subsonic or supersonic), and range, and whether launched from land, air, surface ship, or submarine. Often versions of the same missile are produced for different launch platforms; sometimes air- and submarine-launched versions are a little lighter and smaller than land- and ship-launched versions. Guidance systems can vary across missiles. Some missiles can be fitted with any of a variety of navigation systems (Inertial navigation, TERCOM, or satellite navigation). Larger cruise missiles can carry either a conventional or a nuclear warhead, while smaller ones carry only conventional warheads. A hypersonic speed cruise missile would travel at least five times the speed of sound (Mach 5). is a hypersonic missile currently under development in India and Russia. High Speed Strike Weapon missile based on Boeing X-51. is a hypersonic air-to-surface cruise missile developed in 1990 by the USSR and later by Russia. This missile was designed to cruise from Mach 4 to Mach 6, eventually being able to travel at speeds lower than Mach 10–15. BrahMos shown at IMDS 2007. These missiles travel faster than the speed of sound, usually using ramjet engines. The range is typically 100–500 km, but can be greater. Guidance systems vary. The United States, Russia, India, United Kingdom, Israel, South Korea, Turkey, Iran, China and Pakistan have developed several long-range subsonic cruise missiles. These missiles have a range of over 1,000 kilometres (620 mi) and fly at about 800 kilometres per hour (500 mph). They typically have a launch weight of about 1,500 kilograms (3,300 lb) and can carry either a conventional or a nuclear warhead. Earlier versions of these missiles used inertial navigation; later versions use much more accurate TERCOM and DSMAC systems. Most recent versions can use satellite navigation. These missiles are about the same size and weight and fly at similar speeds to the above category, but the range is (officially) less than 1,000 km. Guidance systems vary. These are subsonic missiles which weigh around 500 kilograms (1,102 lb) and have a range of up to 300 km (190 mi). a locally derivative of Kh-55 and RK-55, made by Artem Luch Vizar (ZhMZ), KhAZ, Yuzhnoe Pivdenmash, powered by an AI Progress Motor Sich MS-400 like Neptun missile and same builders designer . The most common mission for cruise missiles is to attack relatively high-value targets such as ships, command bunkers, bridges and dams. Modern guidance systems permit accurate attacks. 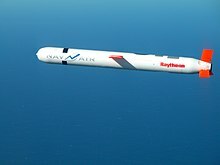 As of 2001[update] the BGM-109 Tomahawk missile model has become a significant part of the United States naval arsenal. It gives ships and submarines an extremely accurate, long-range, conventional land attack weapon. Each costs about US$1.99 million. Both the Tomahawk and the AGM-86 were used extensively during Operation Desert Storm. On 7 April 2017, during the Syrian Civil War, U.S. warships fired more than 50 cruise missiles into a Syrian air base in retaliation for a Syrian Sarin gas attack against a rebel stronghold. The United States Air Force (USAF) deploys an air-launched cruise missile, the AGM-86 ALCM. The Boeing B-52 Stratofortress is the exclusive delivery vehicle for the AGM-86 and AGM-129 ACM. Both missile types are configurable for either conventional or nuclear warheads. Both Tomahawk (as BGM-109) and ALCM (AGM-86) were competing designs for the USAF. ALCM nuclear tipped cruise missile to be carried by the B-52 heavy bomber. Indian Army's BrahMos supersonic cruise missiles mounted on Mobile Autonomous Launchers (MAL). The USAF adopted the AGM-86 for its bomber fleet while AGM-109 was adapted to launch from trucks and ships and adopted by the USAF and Navy. The truck-launched versions, and also the Pershing II and SS-20 Intermediate Range Ballistic Missiles, were later destroyed under the bilateral INF (Intermediate Range Nuclear Forces) treaty with the USSR. The British Royal Navy (RN) also operates cruise missiles, specifically the U.S.-made Tomahawk, used by the RN's nuclear submarine fleet. UK conventional warhead versions were first fired in combat by the RN in 1999, during the Kosovo War (the United States fired cruise missiles in 1991). The Royal Air Force uses the Storm Shadow cruise missile on its Tornado GR4 aircraft. It is also used by France, where it is known as SCALP EG, and carried by the Armée de l'Air's Mirage 2000 and Rafale aircraft. India and Russia have jointly developed the supersonic cruise missile BrahMos. There are three versions of the Brahmos: ship/land-launched, air-launched and sub-launched. The ship/land-launched version were operational as of late 2007. 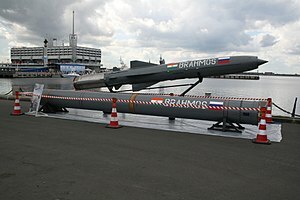 The Brahmos has the capability to attack targets on land. Russia also continues to operate other cruise missiles: the SS-N-12 Sandbox, SS-N-19 Shipwreck, SS-N-22 Sunburn and SS-N-25 Switchblade. Germany and Spain operate the Taurus missile while Pakistan has made the Babur missile, a variant of the US Tomahawk missile. Both the People's Republic of China and the Republic of China (Taiwan) have designed several cruise missile variants, such as the well-known C-802, some of which are capable of carrying biological, chemical, nuclear, and conventional warheads. China has CJ-10 land attack cruise missile which is capable of carrying a nuclear warhead. The French Force de Frappe nuclear forces include both land and sea-based bombers with Air-Sol Moyenne Portée high speed medium range nuclear cruise missiles. Two models are in use, ASMP and a newer ASMP-A. Approximately 60 nuclear missiles are in service, 50 land based and 10 sea-based. India in 2017 successfully flight-tested its indigenous Nirbhay ('Fearless') land-attack cruise missile, which can deliver nuclear warheads to a strike range of 1,000-km  Nirbhay had been flight tested unsuccessfully and repeatedly since 2013, leading to concerns that the project would be cancelled. The Israel Defense Forces reportedly deploy the medium-range air-launched Popeye Turbo ALCM and the Popeye Turbo SLCM medium-long range cruise missile with nuclear warheads on Dolphin class submarines. Pakistan currently has four cruise missile systems: the air-launched Ra'ad; the ground and underwater launched Babur; ship-launched Harbah missile and surface launched Zarb missile. Both, Ra'ad and Babur, can carry nuclear warheads between 10 and 25 kt, and deliver them to targets at a range of 350 km (220 mi) and 700 km (430 mi) respectively. Babur has been in service with the Pakistan Army since 2010. Russia has Kh-55SM cruise missiles, with similar to United States' AGM-129 range of 3000 km, but are able to carry a more powerful warhead of 200 kt. They are equipped with a TERCOM system which allows them to cruise at an altitude lower than 110 meters at subsonic speeds while obtaining a CEP accuracy of 15 meters with an Inertial navigation system. They are air-launched from either Tupolev Tu-95s, Tupolev Tu-22Ms, or Tupolev Tu-160s, each able to carry 16 for the Tu-95, 12 for the Tu-160, and 4 for the Tu-22M. A stealth version of the missile, the Kh-101 is in development. It has similar qualities as the Kh-55, except that its range has been extended to 5,000 km, equipped with a 1,000 kg conventional warhead, and has stealth features which reduces its probability of intercept. In the late 1950s and early 1960s, the Soviet Union was attempting to develop cruise missiles. In this short time frame, the Soviet Union was working on nearly ten different types of cruise missiles. However, due to resources, most of the initial types of cruise missiles developed by the Soviet Union were Sea- Launched Cruise Missiles or Submarine-Launched Cruise Missiles (SLCMs). The SS-N-1 cruise missile was developed to have different configurations to be fired from a submarine or a ship. However, as the time progressed, the Soviet Union began to work on air launched cruise missiles as well (ALCM). These ACLM missiles were typically delivered via bombers designated as "Blinders" or "Backfire". The missiles in this configuration were called the AS-1, and AS-2 with eventual new variants with more development time. The main purpose of Soviet based cruise missiles was to have defense and offensive mechanisms against enemy ships; in other words most of the Soviet cruise missiles were anti-ship missiles. the 1980s the Soviet Union had developed an arsenal of cruise missiles nearing 600 platforms which consisted of land, sea, and air delivery systems. The United States has deployed four nuclear cruise missiles at one time or another. BGM-109 Tomahawk cruise missile in nuclear submarine-, surface ship-, and ground-launched models, nuclear models out of service but warheads kept in reserve. Currently cruise missiles are among the most expensive of single-use weapons, up to several million dollars apiece. One consequence of this is that its users face difficult choices in target allocation, to avoid expending the missiles on targets of low value. For instance during the 2001 strikes on Afghanistan the United States attacked targets of very low monetary value with cruise missiles, which led many to question the efficiency of the weapon. However, proponents of the cruise missile counter that the same argument applies to other types of UAVs: they are cheaper than human pilots when total training and infrastructure costs are taken into account, not to mention the risk of loss of personnel. As demonstrated in Libya in 2011 and prior conflicts, cruise missiles are much more difficult to detect and intercept than other aerial assets (reduced radar cross-section, infrared and visual signature due to smaller size), suiting them to attacks against static air defense systems. The development of hypersonic missiles systems is, however, problematic from a geopolitical perspective. In an article on this topic, Professor Nayef Al-Rodhan warned that a test ban is very unlikely and that the technology will renew a strategic arms race and geopolitical rivalries. ^ "Remote Piloted Aerial Vehicles : The 'Aerial Target' and 'Aerial Torpedo' in Britain". Ctie.monash.edu.au. Retrieved 13 February 2012. ^ "[1.0] The Aerial Torpedo". 13 August 2007. Archived from the original on 13 August 2007. ^ Side note: Both missiles were manufactured under the heavy use of Nazi slave labour. ^ "Russia will refit nuclear powered guided missile cruiser with mach 5 hypersonic 3M22 missiles with 2022 deployment - NextBigFuture.com". 21 February 2016. ^ "Hypersonic version of Brahmos on the way". The Times Of India. 9 October 2011. ^ "BrahMos air launch completes India's supersonic cruise missile triad: Five things you need to know". ^ "Supersonic Stealth Missile". Retrieved 8 October 2015. ^ "International Institute for Strategic Studies – IISS". Archived from the original on 28 June 2012. Retrieved 8 October 2015. ^ "New British missile three times as fast as current weapons". Telegraph.co.uk. 21 June 2011. Retrieved 8 October 2015. ^ "PARIS: Perseus set to go on the attack". Flightglobal.com. Retrieved 8 October 2015. ^ (Retd. ), Col Y. Udaya Chandar (24 April 2017). The Modern Weaponry of the World’s Armed Forces. Notion Press. ISBN 9781946983794. ^ Chandar, Col. Y Udaya (2017). The Modern Weaponry of the World's Armed Forces. Notion Press. ISBN 978-1-946983-79-4. ^ "Iran will unveil its new home-made cruise missile Meshkat in the near future". Retrieved 8 October 2015. ^ Ümit Enginsoy. "BUSINESS – Turkey aims to increase ballistic missile ranges". Hurriyetdailynews.com. Retrieved 13 February 2012. ^ "TÜBİTAK: Hedefimiz 2 bin 500 kilometre menzilli füze yapmak – Hürriyet EKONOMİ". Hurriyet.com.tr. 14 January 2012. Retrieved 13 February 2012. ^ "Türk Füzesi SOM İçin Geri Sayım Başladı – Haber – TRT Avaz". Trt.net.tr. Retrieved 13 February 2012. ^ "Yerli seyir füzesi, 180 kilometreden hedefini vuracak – Hürriyet Gündem". Hurriyet.com.tr. Retrieved 13 February 2012. ^ "Yerli seyir füzesi, 180 kilometreden hedefinin vuracak – Kirpi HABER Cesur | Özgür | Tarafsız Habercilik". Kirpihaber.com. Archived from the original on 7 June 2011. Retrieved 13 February 2012. ^ "Raytheon: Tomahawk Cruise Missile". www.raytheon.com. Retrieved 19 September 2016. ^ "US missiles blast Syria; Trump demands 'end the slaughter'". ^ "'Long Sword': China Shows Off Deadly Cruise Missile Test in Shock VIDEO". sputniknews.com. ^ a b "India successfully tests its first nuclear-capable cruise missile". The Times of India. 7 November 2017. ^ "Nuclear-capable Nirbhay cruise missile's test fails for the fourth time – Times of India". The Times of India. 21 December 2016. Retrieved 21 December 2016. ^ "Hatf 7 "Babur" – Missile Threat". CSIS.org. Retrieved 26 July 2017. ^ Diplomat, Ankit Panda and Prashanth Parameswaran, The. "South Asian Strategic Stability and Pakistan's Babur-3 Submarine-Launched Cruise Missile". The Diplomat. Retrieved 1 December 2017. ^ "Pakistan announces cruise missile success". BBC News. 2017. Retrieved 1 December 2017. ^ Diplomat, Ankit Panda, The. "Pakistan Tests An Indigenously Developed Anti-Ship Cruise Missile". The Diplomat. Retrieved 13 January 2018. ^ Haider, Mateen (9 April 2016). "Pakistan Navy inducts coastal anti-ship 'Zarb' missile after successful test". DAWN.COM. Retrieved 17 January 2018. ^ "Nuclear-capable Nirbhay cruise missile's test fails for the fourth time". ^ Mason, Shane. "Pakistan's Babur and Ra'ad Cruise Missiles: Strategic Implications for India". Institute of Peace and Conflict Studies. Retrieved 20 January 2016. ^ "Kh-101 – Russian and Soviet Nuclear Forces". Fas.org. Retrieved 13 February 2012. ^ Arkin, William (May 1983). "Soviet Cruise Missile Programs". Arms Control Today. 13: 3–4 – via JSTOR. ^ "Cruise missile career comes to a close". U.S. Air Force, Tinker Air Force Base public affairs. 24 April 2012. Archived from the original on 20 December 2013. Retrieved 27 December 2012. ^ "Hypersonic Missiles and Global Security". Wikimedia Commons has media related to Cruise missile. The Evolution of the Cruise Missile by Werrell, Kenneth P.
The Cruise Missile: Precursors and Problems by Werrell, Kenneth P.